Series 62. 325 bhp, 365 cu. in. OHV V-8 engine with dual four-barrel carburetors, four-speed Hydra-Matic automatic transmission, coil-spring independent front suspension, live rear axle with semi-elliptic leaf springs, and four-wheel power-assisted drum brakes. Wheelbase: 129.5 in. Cadillac’s Eldorado was introduced in 1953 as part of GM’s famed Motorama shows, and it quickly established itself as the last word in American automotive luxury at the time. The Eldorado was Cadillac’s flagship, and as the company sat atop GM’s family of brands, the Eldorado became the pinnacle of automotive achievement and the aspirational dream of every GM car buyer. Only the most successful of individuals could afford the pricey $7,286 price tag, and ownership of one was akin to driving a trophy that proclaimed your professional success. Even though the hardtop Eldorado Seville and the equivalent convertible, the Eldorado Biarritz, first went on sale in 1956, the next year brought about several important updates, both mechanically and cosmetically. New for that year was Cadillac’s X-frame construction, which brought increased structural rigidity and helped to make the Eldorado’s ride even more sublime. 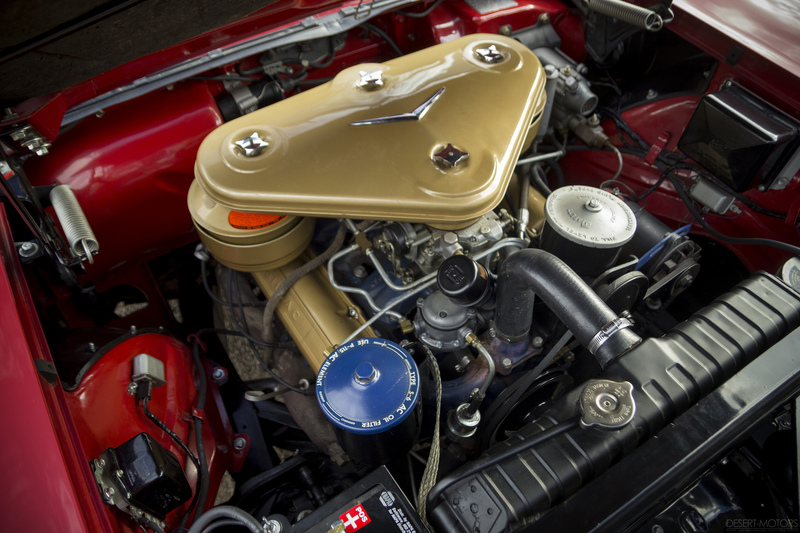 Under the hood lay Cadillac’s 365-cubic inch V-8; it was topped with two 4-barrel carburetors and could produce 325 brake horsepower, which was 20 horsepower more than the standard Cadillac engines. 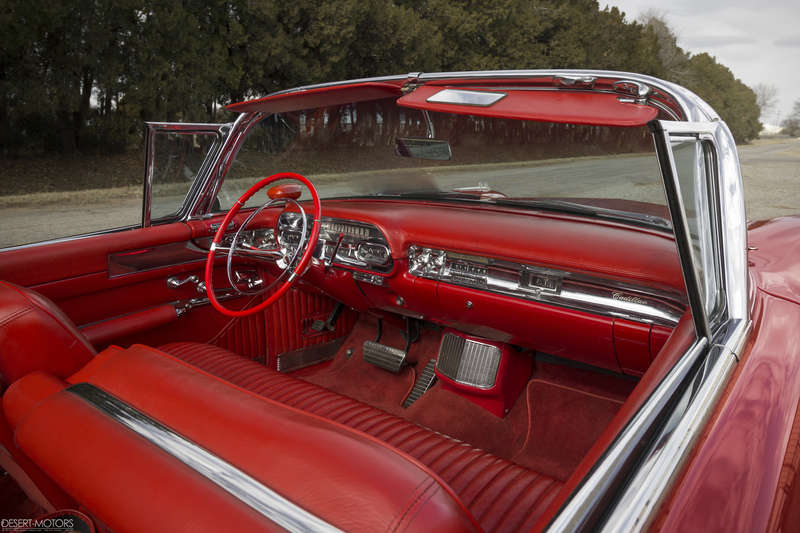 To go along with their new mechanical components, the 1957 Eldorados also received a complete restyling, which was inspired by Cadillac’s Eldorado Brougham and Park Avenue show cars. The aforementioned new chassis also allowed the body to sit lower than it did on earlier cars, reducing overall height and improving the visual impression on the road. The car was given a distinctive tail treatment, which included rounding the flanks and having each bear a single shark-like fin. Only 1,800 Biarritz Convertibles were produced that year, accounting for only a small percentage of total production. The Dakota Red car offered here has been part of its owner’s prominent collection for several years, during which time it has been well-maintained. The parade boot cover for the convertible top has been repainted the correct color, and during the course of a full service, which was performed in December 2014, the car was fitted with all-new brake wheel cylinders, mistakes in an earlier wiring job were correctly repaired, and a new fuel tank was installed. The result is a car that not only looks terrific but also runs and operates equally well. 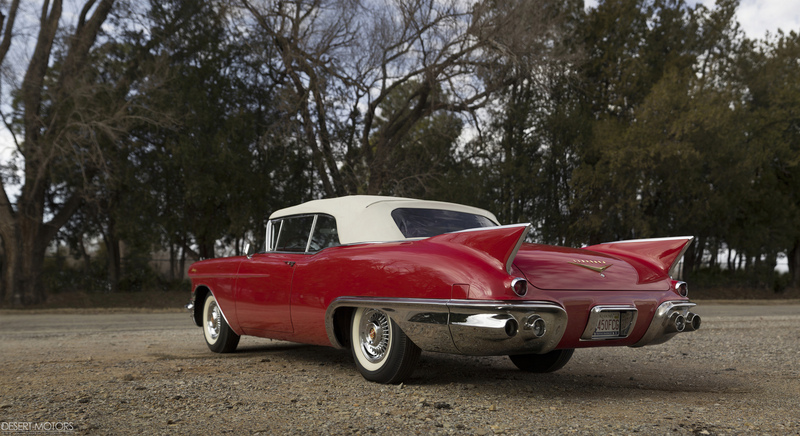 A 1957 Eldorado is one of the most desirable Cadillac convertibles of its era, and this is a prime example.